They say if you don't succeed the first time, you must keep trying until you succeed. Kerin seemed to have this dogged determination to do just that, but in her case, her strength lies in wanting to end her life. There is really no competition to talk about here. She finally won her right to kill herself on Monday night. I strongly believe this has nothing to do with the Argentinians getting bashed by the Germans or the Spanish win over Paraguay. At least she has a more valid reason to kill herself than those young punks who leapt off the balcony of FoxConn's Iphone City. 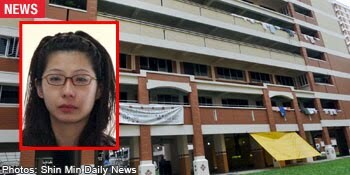 Ms Kerin Peh, 27, is believed to have jumped from the block where her family lives at Hougang Ave 8. Paramedics who arrived at the scene around 2am, pronounced her dead. The widow of bridegroom Vernon Leong, who mysteriously fell to his death from the Hilton Hotel on the night of his wedding last November, died early Monday. Last December, she also tried to take her life by slashing her wrists at the home of her parents-in-law in Balam Road. Friends of the couple said then that Ms Peh had been an emotional wreck after her husband's death, and family and friends had had to keep close watch over her. With the monthly MRT suicide quota rising, and those who gas or smoke themselves to death, one wonders what kind of help are the PAP members doing to help, besides talking about it in Parliament and interviews. What have the PAP done to repair shattered lives, besides helping to shatter lives with their fines, prison terms, long queues, packed trains, costly homes and cars, and money-sucking technologies? Miss Kerin Peh, 27, the widow of the groom who fell from Singapore’s Hilton Hotel a few hours after their wedding dinner in Nov 2009 has been admitted to the A&E department of Tan Tock Seng Hospital on yesterday morning. She was found with cuts to both her wrists and the Police has classified the case as attempted suicide. The Singapore Civil Defence Force and the paramedics who arrived at Kerin Peh’s parents-in-law’s home found her unconscious on a bed with some unidentified pills beside her. THE widow of a man who mysteriously fell to his death from the Hilton Singapore hotel on his wedding night last November was herself found dead yesterday. Ms Kerin Peh, 28, fell from the sixth floor of a 12-storey HDB block opposite her family home in Hougang Avenue 8 around 2am. A member of the public called for help after seeing her bleeding, motionless body lying face-down at the bottom of the block. Paramedics pronounced her dead 15 minutes later. Ms Peh had been an emotional wreck ever since her husband’s body was found in the driveway of the Orchard Road hotel on Nov 4, just hours after their wedding banquet. She tried to take her own life a month after the incident by slashing her wrists in a bedroom of the Balam Road flat belonging to her parents-in-law. Unidentified pills were found beside her, and she was rushed to Tan Tock Seng Hospital. Since then, her family has kept a sort of ’suicide watch’ on her. What happened to her husband, computer peripherals salesman Vernon Leong, 31, remains a mystery, and his case is due to appear before the coroner’s court, but no date has been given. The couple had a suite on the 10th floor of the hotel. After the dinner, they adjourned to the room with a few friends where they had more drinks and continued the celebration. Friends contacted later said the mood that night was merry. After everyone had left, Ms Peh took a shower. But after she emerged from the bathroom, she discovered that her husband was not in the room and raised the alarm. Security cameras showed Mr Leong leaving the room clad in shorts and a T-shirt at about 3am and rushing barefoot through the hotel’s second floor. Minutes later, he was dead, having fallen from a height and landing on the hotel’s driveway. No other details have emerged. Yesterday, neighbours told The Straits Times they had heard loud crying coming from the family’s home around 1am. Not long after, Ms Peh’s barefoot body, clad in pyjamas, was discovered. Ms Peh had moved back to live with her mother and elder sister earlier this year. A 72-year-old neighbour said Ms Peh’s mother had watched over her carefully, especially after she expressed a wish to kill herself. His domestic helper said she had seen Ms Peh with her sister the day before her death, and she ‘looked happy’. Ms Peh’s body arrived home at around 4pm yesterday. 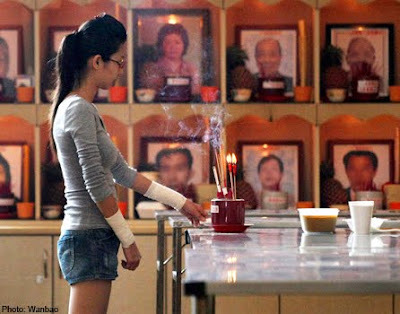 Family members tearfully declined to be interviewed, after saying Buddhist prayers for her. About 60 people attended the wake in the evening. When asked if they knew anything about Ms Peh’s state of mind, they declined to comment. Counsellors told The Straits Times that families need to seek help if a relative has shown signs of being capable of hurting him or herself. Watching over the person all the time can also be ‘difficult and draining’ on family members, said the executive director of Samaritans of Singapore, Ms Christine Wong. One option is to admit them to hospital to get the help they need, she said. Police have classified the case as unnatural death, and are investigating. I remember one colleague mentioned that when a person chooses to end his life, he is already not himself. Because for one conscious mind to take the very first step to kill own self will take a great deal of "courage" and determination. Recently, 2 suicidal news caught my attention. The news were on the Korean star and Ms Kerin Peh (I will call her the Bride). I realised how tough times can be, to cause such distress to human beings like us who are educated and "were taught how to handle things in life". Some of us learnt vicariously, while others have to go through the harder way, i.e. personal experience. Saw some comments about the news about The Bride who took her life just yesterday. Some were sympathetic while others criticised and preached how precious life is. I am not here to judge but I think one has to go through a great deal of trauma to understand. For me, I took a sympathetic stand. Really felt sorry for her having to go through the pain and yet not able to "recover" from the heartache. As for the Korean actor, it was said that the stress and guilt in juggling his career and his ill dad pushed him to choose this path. He said life was hard. Indeed, life was very difficult for the 2 cases. Depression is a trap. To get out, you have to be willing to leave a part of you and free the rest of yourself. Some are lucky enough to pull themselves away while others need others to give them a thug. Of course, there are also some who "choose" to fall deeper and deeper. 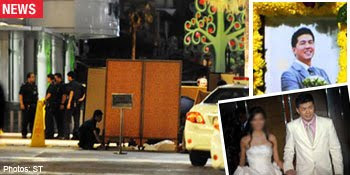 THE bridegroom who died hours after his wedding dinner was caught on three of Hilton Singapore's surveillance cameras. Footage revealed that Mr Vernon Leong, 31, headed towards the fire escape staircase on the 10th floor - the same floor his wedding suite was on - at around 3am. He was wearing a T-shirt and shorts when he left the room. He was also barefooted and empty-handed. The bridegroom was next seen on the second floor of the hotel approximately eight minutes later. He appeared to be in a rush and was scrambling. Shops line the second floor and there are no windows or openings. It is not clear where he went or what he did after this. At around 3.16am, the third time he was seen on camera was when his body was already on the driveway. He was dead by the time paramedics arrived. During investigations, police found the door of the fire escape exit on the 5th level open. They are not ruling out the possibility of Mr Leong exiting at this floor before he went down to level two. CCTV footage also revealed that he was never at the roof-top garden on the 24th floor. Before the videos were viewed, this was the most likely place where he could have fallen from. His wife, Ms Peh, 34, had initially thought that her husband had gone there to smoke. Authorities are still unsure as to which floor the bridegroom fell from and mystery surrounds the circumstances of his death. According to Shin Min Daily, the body was found facing upwards. Police have classified the case as unnatural death and the management of Hilton Singapore has also issued a press statement, extending their condolences to Mr Leong's family and that they are cooperating with the authorities in the investigation. It's a sad day for everyone, amen. But in my heart, even me as a Christain,...my heart sank and at times, I do cry for them, amen. Honestly, I do pray for their happy and lloving returns in after death/live and may they find love in netherworld...Hope Gods will path their ways and remake them to living persons as role model of true love... Amen. All in all, I conclued that its a very sad and tragic happenings in the span of 8 months, and do hope Kerin's death will have the closured for both living family members, and dearly hope and bless Kerin for her fonding of her husband and wholeheartedly, able to find both in netherworld where their love for each other pervails. To all, God loves you all, amen. Where the news of the lady died 10yrs ago?